The subject of this blog is power. But the first thing to understand about the protest rally I attended on Tuesday at Wisconsin’s State Capitol in Madison — against the fast-tracking of a “right to work” bill for Wisconsin law — is that this was no gathering of leftist agitators. The day before the rally, Milwaukee ultra-conservative radio talk show host Charlie Sykes referred to the people he imagined assembling as “Unionistas,” implying militant Communist plotting, a typical and dated political fear-mongering. I must comment on Sykes because he is so influential among Wisconsin conservatives and “Tea Party” members and anyone who feeds off his highly rated WTMJ program. Talk about power. He broadcasts on the most powerful radio station in the state, by far. Fully aware that right-wing politics feeds off talk radio, radical Governor Scott Walker has a constant direct line to Sykes’ program. I recall the governor’s current radio mouthpiece when I worked with him for The Milwaukee Journal in the 1980s. 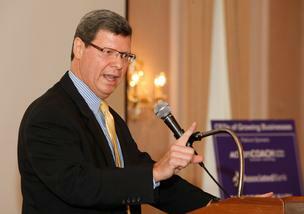 Then a cityside reporter, Charlie Sykes would walk around the newsroom with a curiously remote air. He never spoke to me, or to very many fellow reporters that I ever noticed. He just seemed a little odd to me, and this was before I had any notion of his political views. Now I interpret his newsroom manner as an imperious sense of superiority, and perhaps a sense of political alienation because — although professional print journalists work hard to be objective reporters — most reporters’ personal politics tend to be centrist or liberal leaning. However, another former Journal colleague who knows Sykes and claims to be friends with him is Joel McNally, the affable and left-leaning writer with the infectious giggle. Back then, Joel was a newsroom star, writing a popular satirical column for The Journal, often about political matters. 2. “There’s nothing satirical about promoting racial hatred,” McNally wrote in The Shepherd Express for which he now does a weekly column. “I’ve written a lot of satire. You create satire by pretending to adopt a point of view you disagree with and promoting it with such exaggerated, ridiculous arguments that the whole idea is exposed as absurd. “Sykes and his mean-spirited audience do not think the idea of poor inner city blacks living it up while ripping off taxpayers is absurd. That’s actually one of the basic premises of his show.” 3. Sykes claims that covering some of the urban problems in Milwaukee changed his own politics because he perceived that liberal “welfare state” solutions were untenable. He apparently did a black-and-white ideological flip-flop — if he was ever a liberal at all. Before too long, he left the newspaper. It’s been a long time since he’s been a legitimate journalist, in the traditional sense, of serving the public interest with information they can use to make up their minds about a news story or a political development. His program thrives on his right-wing assumptions and biases, just as liberal talk programs do on theirs, to some degree. But none of those are really heard in Milwaukee. Meanwhile, Sykes’ morning show is so often sadly under-informed and under-reported, or selectively informed at best. He operates in relationship to a reality that’s not much more connected than Rush Limbaugh’s to that of an ordinary working or working-poor Milwaukeean, or American. Unless most of their information comes from such radio talk. 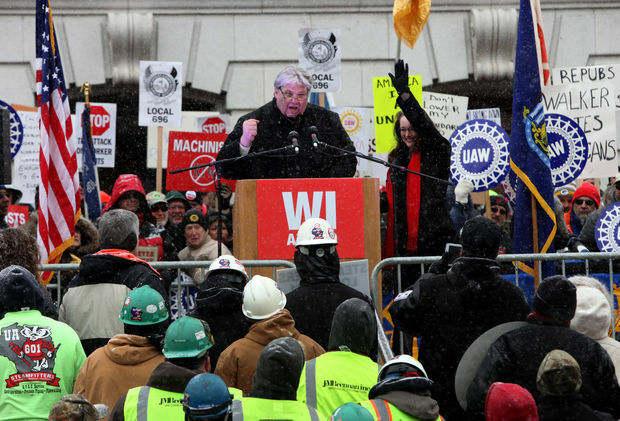 The crowd gathered at the Wisconsin Capitol Tuesday to protest the fast-tracking of a “right to work” bill. Another protest was held Wednesday. 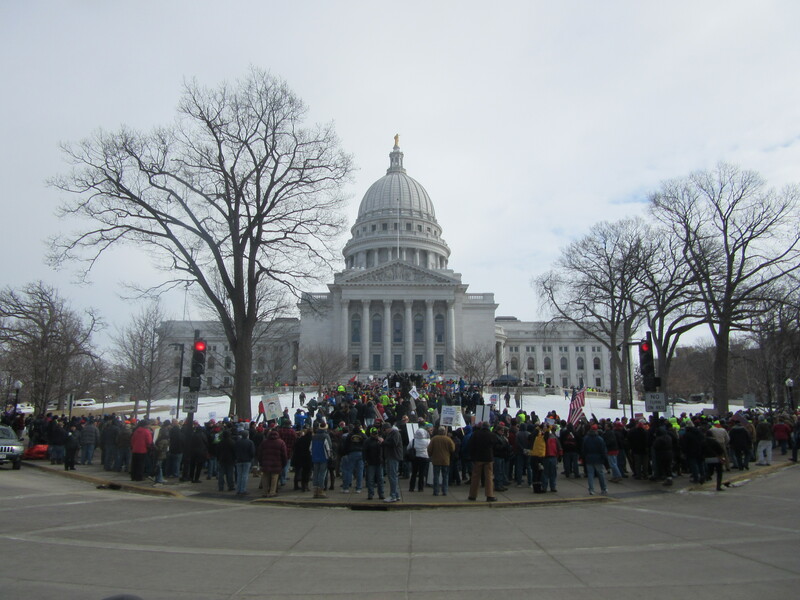 Now, to the “right to work” bill protest I witnessed Tuesday. Contrary to Sykes’ glib characterization, the spirit of this event was as patriotic and American as God and country, mother and Apple Pie. Laborers of many different trade unions, some in hard hats, filled the crowd. 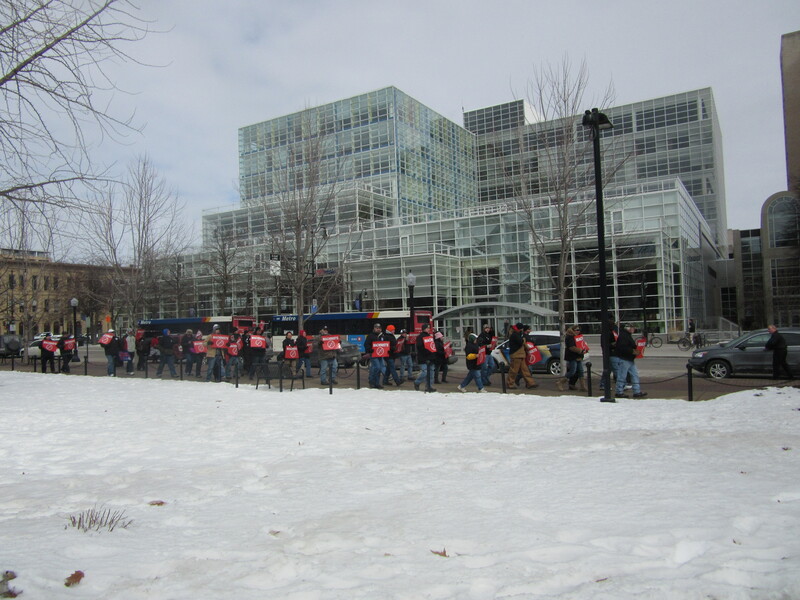 A group of machinists did their own march around the capital to protest the right-to-work bill (see photo). The program began with emcee Phil Neuenfeldt, Wisconsin’s AFL-CIO president, leading the crowd in The Pledge of Allegiance. Then the Solidarity Singers sang “The Star-Spangled Banner. “ our national anthem. Neuenfeldt then asked a priest, Father Jim Murphy, to give an invocation, which was a prayer for the gathering. Several big American flags flapped in the icy wind, along with various union flags, amid the thicket of protest signs. People in the Tea Party, and politicians who cater to them, like to wrap themselves in the American flag and think their extreme aversion and often paranoia about government is what America is about. This gathering at our state capital was what America is about. Mahlon Mitchell, president of the Professional Firefighters Association of Wisconsin, reprised a refrain he used several years ago for the hundreds of thousands of people who gathered here in the summer of 2011 for protests of Gov. Walker’s Act 10 destruction of public sector union bargaining rights. “We know what democracy looks like, right?” Mitchell called out to the crowd. “ Democracy looks like this!” the multitude roared in massive and hearty unison on this cold but sunny and crystal-clear February afternoon. Mitchell was one of a number of eloquent speakers, all associated with Wisconsin unions. “We know it’s out of state special interests pushing this bill. They want power. “They don’t care if you had a good job or decent benefits or can afford to spend your kids to college. What they want is more profits and they want to do it on the backs of workers. “We know, and history teaches us, that a strong union movement builds the middle class and raises all boats. There is nothing more American than workers coming together, through their unions, to stick together. That’s what we’re doing here today, coming together to have each other’s backs, right? The word that sticks with me amid all this well-put, all-American common sense is the word power. The fast tracking of the bill, employs the same strategy used in at least two neighboring Midwestern states which are now “right to work.” The governor’s stated philosophy is “divide and conquer” – build resentment in non-union workers against union workers. Since making that statement to a rich donor, Walker has deftly played “rope a dope” with the press and the public on the issue during his last term and last election, saying “right to work” was a distraction” and that he would “do everything in his power” to prevent such a bill from reaching his desk. Now Walker has safely gained re-election for a second term, and is gallivanting around the country to try for presidential bid, and he has changed his tune. His Republican cronies in the legislature worked up this bill, which he now says he will sign when it gets to his desk. This is yet another oppressive power grab by this gubernatorial administration. Walker, son of up Baptist preacher, talks about God giving him the blessing to pursue his ongoing quest for more power. Yet, there’s something to learn from a philosopher who studied power. I speak of Frederick Nietzsche, the existentialist thinker and writer but especially as contextualized by the great American philosopher William Barrett, a great interpreter of existential philosophy, especially in his classic book Irrational Man: A Study in Existential Philosophy. Understand, I don’t consider myself an existentialist, per se. But the philosophy substantially informs my thinking. I was raised a Catholic and today informally call myself a Unitarian agnostic, who still prays in my own ways, just like Father Jim Murphy does, publicly and privately. Any reflective person cannot ignore modern history which includes the existentialist philosophical movement. It grew out of the experience of World War II, and the horrors of the Holocaust, which drove many people to question whether God was still alive. Though many people think of existentialism as European, the philosophy profoundly informs the American experience, with our history of The Civil War, The Gilded Age, and especially since The Great Depression and the post-war experience. That dark “Twilight Zone” sense of dread that life’s uncertainties, unfairness and pitfalls can impose on the celebrated American individual is perhaps an “irrational” fear, but a very real one. Didn’t most of us feel it on 9/11, and perhaps the 99 per cent of us during our Great Recession? Existential dread permeates most classic American crime fiction and the great American tradition of film noir cinema. Barrett writes that Nietzsche prophesized remarkably that “nihilism would be the shadow, in many guises and forms, that would haunt the 20th century. Supposing man does not blow himself and his earth to bits, and that he really becomes the master of this planet. What then? (Barrett’s book was published in 1958 and the paperback edition in 1962 through the height of the Cold War, an even larger existential treat). Note how relevant Barrett is to today: “Power for power’s sake, the matter of how far powers extended, leads always to the dread of the void beyond. The attempts to stand face-to-face with that void is the problem of nihilism. For the existentialists who felt that the other higher eternal realm (of religious belief) is gone, Nietzsche declared, man’s highest values lose their value. The only value Nietzsche can set up to take the place of these highest values that have lost their value for contemporary man is: Power. “To the degree that modern life has become secularized these highest values anchored in the eternal, have already lost their value. So long as people are blissfully unaware of this, they of course did not sink into any despondency and nihilism; they may even be steady churchgoers. Nihilism never goes away. Now the gruesome brutality of the Middle Eastern radical terrorist group ISIS seems as nihilistic as anything. Will we start another ground war again? Walker would, he says. It’s uncanny that he wrote this in the late ‘50s-early ‘60s, but it is also the era of the TV show “Mad Men” as well. At the pro-union rally protest I attended, clearly the head of the AFL-CIO and all the other speakers had plenty to say about thinking that needs to be changed, and about giving meaning to human life. But what do Scott Walker and the Republicans — by rushing this bill through — have to say other than talking about “freedom.” The freedom, that is, to work without paying dues, and yet receiving all the benefits and pay rates that a union works hard for all the company’s workers to enjoy? Walker and the Republicans want to outlaw union fees that people who prefer not to join a union might pay for the benefits, the better training, the workplace safety, and wages union provides them. It’s “peddling a double standard” as Democratic State Senator Robert Wirch said, because Wisconsin chambers of commerce require all businesses to pay fees to them so that the powerful commerce chambers will protect them when they need legal or funding help or otherwise. But the Republicans want to legally strip workers of that protection. The subject of this sort of government intrusion on private business affairs is worthy of a full public debate and discussion. Scott Walker has been a career politician since he since he was in college at Marquette University. He allegedly played dirty tricks in running for a school office by removing from on campus news boxes all the newspapers that endorsed his opponent, among other questionable tactics. A short while later he dropped out, far short of his degree. Shortly after that he began the full quest, a will to power that has been driving his life ever since. Do you have much sense that he cares about Wisconsin today, as he traipses around the country trying to get billionaires and to give him money for his presidential run? For his occasional son-of-a-preacher pieties, one senses he is walking through a nihilistic void of pure power seeking, with political caginess but heedless hubris, over which even some conservatives shake their heads in dismay. “I wouldn’t bet against me on anything,” he recently boasted to a reporter. 5. His grandiosity grows. When asked recently how he’d take on the ISIS terrorists he made a distasteful association with Wisconsin protesters: “If I can take on 100,000 protesters, I can do that across the world.” 6.
Who does he speak for other than his vainglorious self, in disarming platitudinous rhetoric, except to the extreme right political base, and Republican Party establishment looking for an electable candidate, and most of all to the richest one percent in America. Who else is he really working for? Photos by Kevin Lynch, unless otherwise noted. The remarkable story of that huge event, which helped to inspire the Occupy Wall Street movement is documented in the book Uprising: How Wisconsin Renewed the Politics of Protest, from Madison to Wall Street by John Nichols, Washington correspondent for The Nation magazine, and associate editor of The Capital Times in Madison, and another former colleague of this writer. McNally was also the union steward of the first newsroom union to ever grace The Milwaukee Journal in the mid-1980s. I happened to be the first personnel case that the new union stood up for. I was laid off from my job as a part-time staffer in the features section in what amounted to a power move by an editor vying for a high position and trying to show he could tighten up a budget. The lay-off had nothing to do with my performance. An independent arbitrator decided that the newspaper had unfairly laid me off without offering to relocate me to another position, although I did apply unsuccessfully for a couple of other positions. Thanks to the new union’s president Jack Norman, steward McNally and others, I got my part-time staff position back, along with nine months back pay. 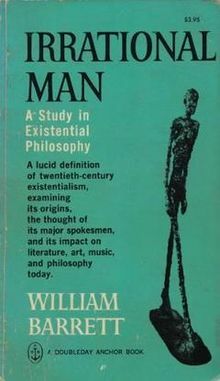 William Barrett, Irrational Man: A study in Existential Philosophy, Anchor Books, 1962, 203-205. 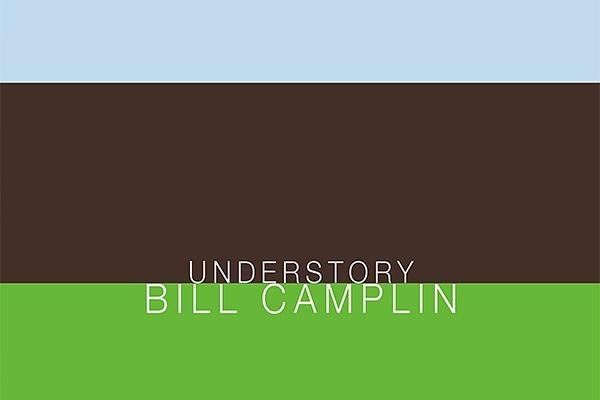 Bill Camplin observes and invokes life with unblinking candor on his inspired new recording. This crystal-clear Nashville-recorded session stands as Camplin’s strongest-ever album of original work. Peerless in its naked, high-baritone beauty, his voice employs Dylanesque duskiness and deftly doled drama, often wrapped in rueful irony. Camplin testifies to human foibles and futility, as personal confession and for those underfoot, suffering exploitation. Therein lie his “understories,” insightful, humane and possessing a perfect pitch of indignance. “Seems I’ve Seen This Night Before” attests to Everyman’s flounderings: I’m losing all concept of what I intend/playing the victim and stumbling away. Between our future and our past, let us rage against the night. 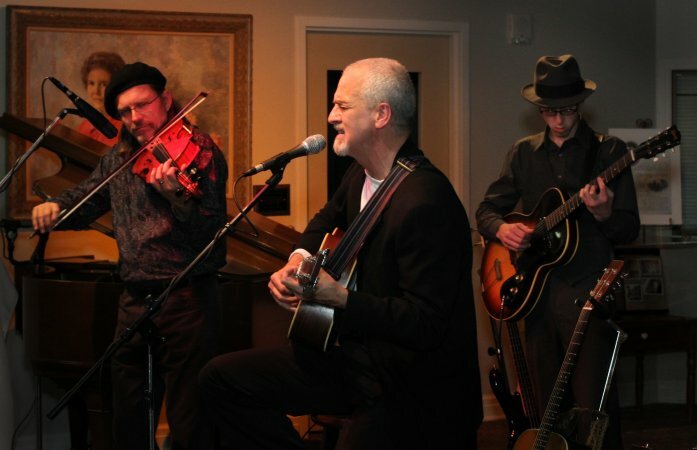 The album bristles with musical variety as Camplin’s son and album producer Satchel Paige interjects pithy, conversational guitar fills and hand-in-glove gestures, especially on the brilliantly arranged “All in the Name of You.” Trumpet, cello, organ and pedal steel help till Understory with spades of fresh vigor. We should hear more from the talented Mister Paige before long. But Camplin, the 68-year-old co-owner of Fort Atkinson’s roots music mecca Café Carpe, ain’t going nowhere soon, one hopes. 1 He’ll release a live recording of a renunion of the Cardboard Box band, named for his 1975 album. He plans two more volumes of his masterful Dylan interpretations, documented first in Dylan Project One from 2003, along with another album of originals still unfolding down the dusty roads of his mind, and a “country” album. Don’t wait for those to catch up with Camplin. Here’s an Understory: One day, he suddenly disappears, like many a mythical or forgotten troubadour-poet eccentric. They bury him in an ungainly cardboard box in a modestly marked grave on the banks of the Rock River. Then his remains wash away in the streams of time. Which, as we know, waits for no one. 1. Cafe Carpe, also a fine eatery, has a long history as a Midwest crossroads for great and obscure singer-songwriters and vernacular groups. The Carpe also provided the artistic sowing ground of Peter Mulvey, Jeffrey Foucault and the collaborative group Redbird, among others. Among recent acts I’ve seen there include Redbird (Mulvey, Foucault, Kris Delmhorst and David Goodrich) at their holiday season concert series and, last month, Steve Forbert, another baby boomer rudely defying the ravages of age. New York Times Magazine photo illustration by Andrew B Myers. No, I’ve never been victimized yet, as have the article’s subjects. But I’m interested in finally starting my own Twitter account. As I read, I began to again reconsider plunging myself into the shoot-from-the-hip mentality that dominates this social media. At least on Facebook, you can contextualize your comments more thoroughly, so that misinterpretations like those that ruined a number of people’s lives don’t explode in their faces, often before for they realize the reactions have spread like a monstrous global cancer. She preceeded that with sassy tweets about a “weird German” with body odor, and “bad teeth” Brits. And before snaggle-toothed Austin Powers could say “Oh, behave!” countless quickly intrepreted that, being white, Socco thought herself above AIDS — too privileged — to get it in Africa. But swift judgment is contagious on social media and especially on the forced glibness of Twitter’s 144-character virtual reality. That virtual quality insulates the Tweeter who lashes out. Readers viciously pecked Socco’s personhood and her career to death (flashes of Hitchcock’s The Birds, but such tweeters displayed the crows’ same pack-attack mentality). The pain and damage to a person’s psyche and a life are quite real. Justine remains, a year later, still “wracked by PTSD, depression and insomnia,” after she lost her job as a senior director of communications at IAC (a leading online consumer service company). Right then, it struck me again, why I had been so fascinated by the Italian painter Titian’s painting “Christ and the Adulteress,” which I had seen in person recently at the Milwaukee Art Museum and which now I have as my computer screen saver. The painting was a centerpiece of Heaven and Earth: 500 years of Italian Painting from Glasgow Museums, now at the Santa Barbara Museum of Art, California, through May 3 under a somewhat more secular title: Botticelli, Titian and Beyond: Italian Masterpieces from the Glasgow Museums. Justine’s and Abigail’s stories helped me understand that this painting’s alluring and sculptural tangle of figures says even more about social matters than I had first inferred. Like Abigail, the woman in the famous Bible story appeared guilty of adultery and, with a swift judgment, the Pharisee drags her to Christ, actually with the duplicitous intention of trapping him into defying established Roman law by defending her. Working in suspicious shadows, the self-styled messiah does just that, helping seal his own fate as a dissident radical. 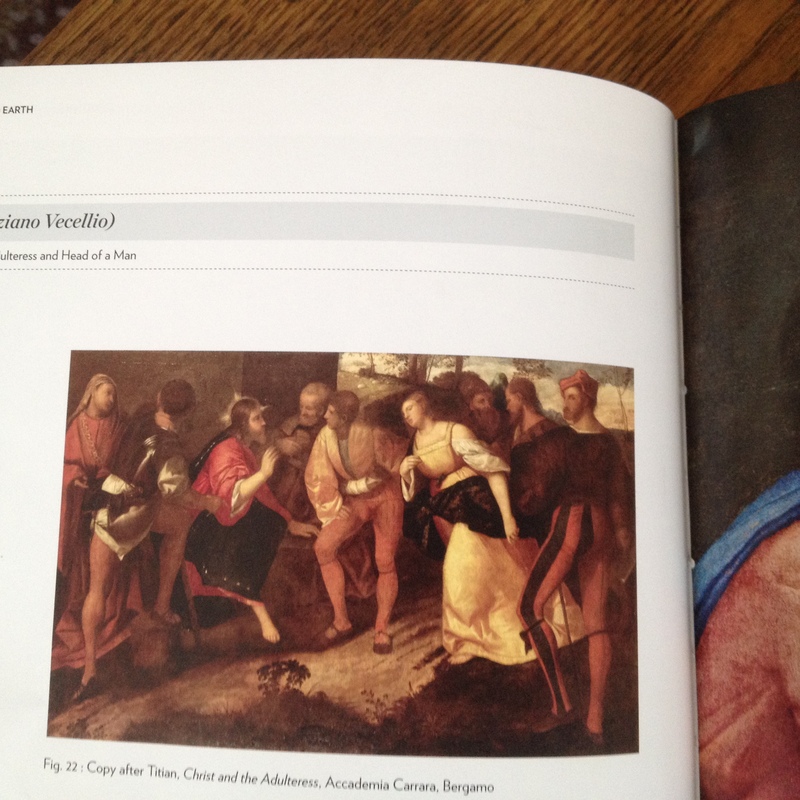 But the artist Titian has societal fish to fry with all those busybodies crammed into this compositional pan. You can count five other people standing nearby as the Pharisee baits Christ to become the sixth, or become a criminal himself. On the left, the man with his foot on a tree stump addressing another woman on his left while aiming the proverbial pointed finger of blame at the poor woman. The woman listening, as a credit to her gender, looks on balefully, as if questioning the quick condemnation. Titian also inserts two men in the background, explicitly to show two smirking men gabbing, clearly indulging their own clucking opinions of the woman. The original painting actually had another man on the far right, whose knee remains still visible against the accused woman’s white skirt. Look at the copy of the original uncut painting below. 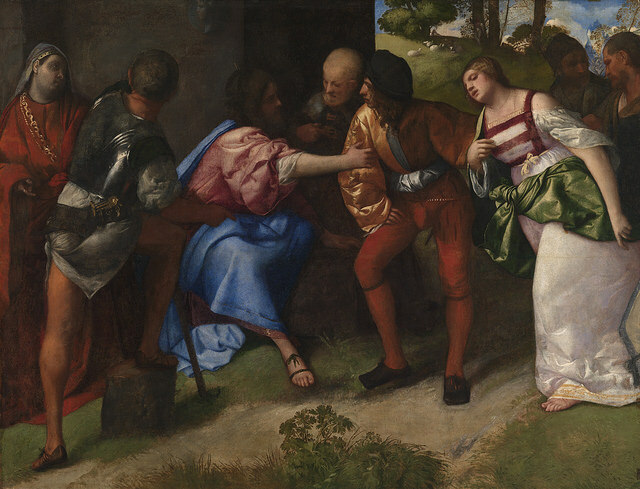 Titian probably cut the canvas because his better sense decided this large figure made the composition too busy. The self-consciously dandy he eliminated seems more interested in posing than in the dramatic moment. Nevertheless the figure further underscores Titian’s original point of how public the woman’s shaming felt to her. Copy after Titian, “Christ and the Adulteress,” Accademia, Carrara, Bergamo. Photo of catalog reproduction by Ann Peterson. The man on Christ’s left shoulder, perhaps the disciple Peter, seems the only one paying attention to Christ. Yet the elder man puts his hand to his chest as if taken aback by Christ’s bold defiance of the Pharisee, and of conventional moralism. So Christ is essentially alone in this crowd taking the stance. Yet, of course, even though he speaks to defend her from a stoning, the woman must feel more alone than anyone, as her abject countenance makes utterly clear. Her head, legs and feet still recoil and resist her apparent fate while the Pharisee drags her arm and upper torso forward. So the painting brims with politics at several different levels — the “gotcha” entrapment of Christ himself in defying the law, and of the caught-in-the-act woman. And Titian highlights the naked self-righteousness of political correctness even as he hides the hero’s face in the shadows. Christ clearly dwells in a different realm of spirit, understanding and insight. Now Titian’s painting and Christ’s message seem more timely than ever. We see a mere handful of people indulging in the latest gossip. On Twitter, literally millions can quickly pounce on such an admittedly insensitive tweeter like Justine. Her life quickly crumbles into a shambles. Socco is far from “fine.” Most of us know at least something about depression, insomnia and unemployment. Poorer understood is post-traumatic stress disorder, and it’s far more common than people think. We hear a lot about soldiers suffering from it, but I know at least one friend who has suffered with the diagnosis for years after her boss repeatedly abused her. She eventually lost her job, in a staff downsizing. Ronson’s article and this painting help me to understand my friend’s situation, even though she was hardly guilty of anything — rather she courageously stood up repeatedly to a bully boss. 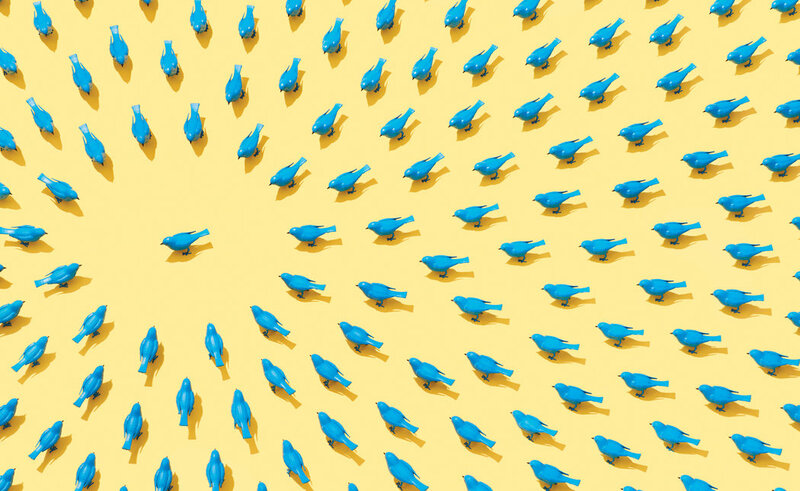 So I think I’ll probably think once yet again about whether I’ll enter the still-strange-to-me-me Twitter world even though — as the insightful, recently deceased New York Times media writer David Carr noted — Twitter is good discipline for a writer to boil down his statements. But I strive to do that on Facebook because I know most people scroll and read quickly. Biddle eventually apologized to Socco. Her story, and the story Titian tell us in his painting, show how we still have much to learn from very old history, and from old art, and from both great leaders and the anonymous players — like the unnamed adulteress woman — who suffer in their tortured symbolism. Today “smart” phone photo images of her might saturate the Internet, smeared in electronic shame. Would that the “fallen” Biblical woman, like Justine Socco, live on as a symbol of a flawed person whom the great humanist Christ valued — beyond her real or perceived “sins” — for struggling along life’s up-and-down path. Most wise storytellers or artists give their protagonist a fighting chance at redemption, before a mob-rule sentence is passed. Why not tweeters, too? 2. The nation’s most polarizing state governor continues to get mostly roses thrown at his feet by national and even local media, surprised by the Teflon quality he shares — so far — with his innocuous rhetorical role model Ronald Reagan. Yet Walker continues frequent ideological overstepping, trampling not only on the roses but the pursuit of education and knowledge and social equality, among other worthy goals. The image of the larger uncut version of the Titian painting is actually a painting done “after Titian” by staff Academia Carrara, in Bergamo, Italy.